he was elected as MLA from Barnala Assembly Constituency and represented the Constituency till 1999. In 1969, he became Education Minister of Punjab. During his tenure, he was instrumental in establishing Guru Nanak Dev University in Amritsar. In 1977, he was elected as MP and was inducted as Cabinet Minister in Janata Party's Government headed by Morarji Desai with Agriculture, Food, Irrigation and Rural Development as his portfolios. When he was elected to the Parliament, Barnala Assembly Constituency seat fell vacant and was contested by his wife Mrs. Surjit Kaur who won with a large margin. During Emergency and after operation Blue Star, he was kept in Solitary confinement for a long time. He went to jail nine times for various political agitations and spent in all, three and a half years in jail. 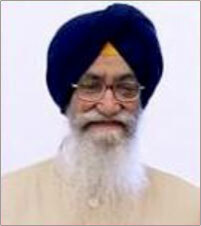 In 1985, he was elected President of Shiromani Akali Dal after the assassination of Sant Longowal. Under his leadership, Akali Dal had a landslide victory in Assembly Elections and he became the Chief Minister of Punjab in 1985. He managed the affairs of the State very well in spite of there being terrorism at its peak in those days. He stood like a rock against terrorism and became the prime target of terrorists. He faced them boldly when other politicians in the State had succumbed to their threats. IN 1990, he was appointed as Governor of Tamil Nadu, but due to some differences with the Central Government, he resigned after about a year. He was elected to Lok Sabha in 1996 and again 1998 and was appointed as Cabinet Minister with Chemical & Fertilizers and Food & Civil Supplies Portfolios. He was the first Governor of Uttranchal State. He was the Governor of Andhra Pradesh from 03.01.2003 till 02.11.2004. On 03.11.2004 he assumed office as Governor of Tamil Nadu.